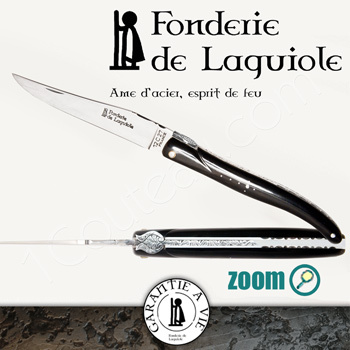 Laguiole Legend knife 12CM, TIP HORN full handle, delivered in its box with a certificate lifetime warranty by the manufacture Fonderie de Laguiole. 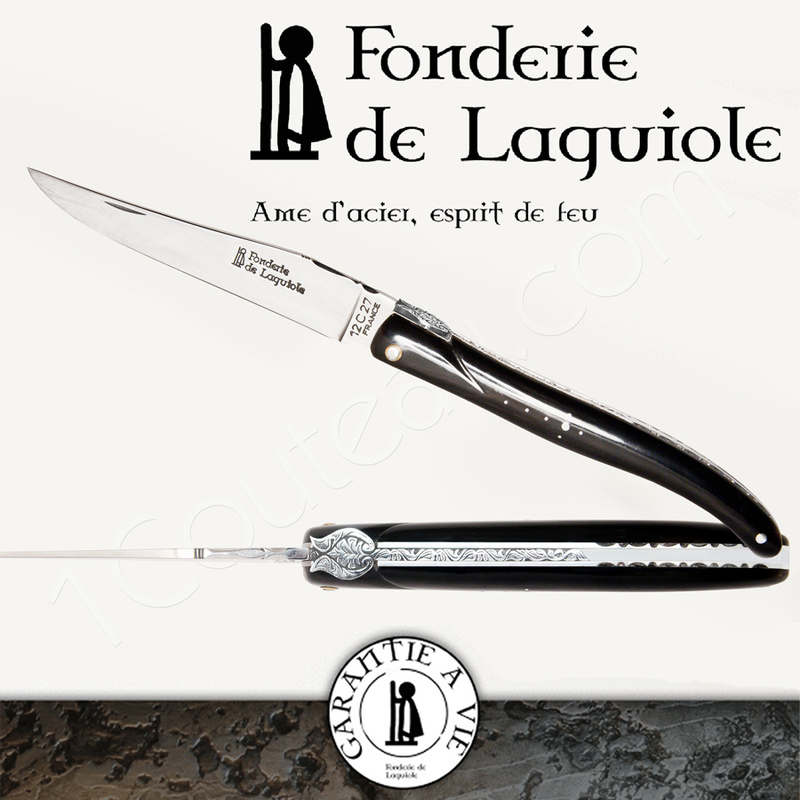 12 cm 1 piece and, full Tip Horn handle with floral bee, by the Fonderie de Laguiole manufacture. -Blade: 12c27 stainless steel, 3 mm thick at the heel, hardness: 56Hrc. Polishing and finishing of the blade by hand. The punch Foundry Laguiole affixed to the blade of this knife gives you a lifetime warranty by the manufacture Fonderie de Laguiole. -Handle: The handle is fashioned entirely by hand. -Technical: (LEGENDE) Original model where the talent of Cutler is expressed in a constant search for perfection. Les motifs variés, le ressort et une partie du dessus de lame sont sculptés à la lime dans la masse, ce qui en fait une pièce unique. Blade stop manually adjusted, ensuring a sharp very long, the blade is not hitting the bottom of the knife when closed. -Presentation: In a box with Lifetime warranty certificate. -All the parts are subject to the greatest attention, with careful selection of materials and nearly 25 years of experience for some of the companions.